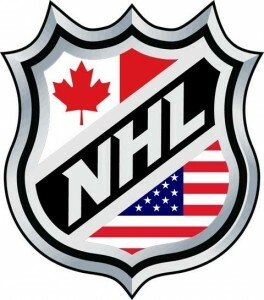 America’s Ice Hockey season is about to start, and as per normal, we will be producing predictions for the upcoming season. All in all we have predicted 3815 totals bets for a return of 6.1% ROI. Last year we made 3%, but the year before cleaned up with 13.1% ROI. 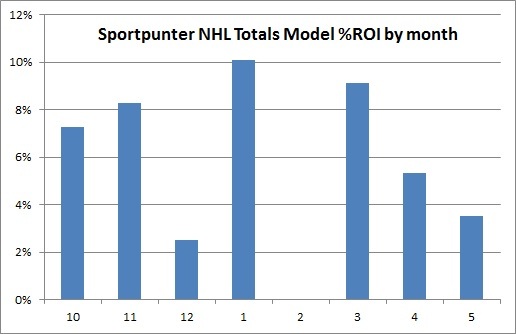 Interestingly, by the end of January last year, the model was sitting on 18% ROI for the year. We’ve done an analysis by month to show you how the model goes ever y month. Shown below is the graph, which shows that the model has traditionally kicked off very well averaging over 7% ROI in October (month 10). February came out break even (0% ROI, month 2), and months 4 and 5 were less that other months, maybe because of the variability in finals totals. So clearly, the model does well from day 1, and hopefully this trend will continue on 2015. Subscriptions are now available and places are limited and will be closed.